HOUSTON -- Could McDonald's be a victim of the latest hack or was it the sneaky Hamburglar? You might not hear President Donald Trump say "I'm lovin' it" any time soon about the golden arches. 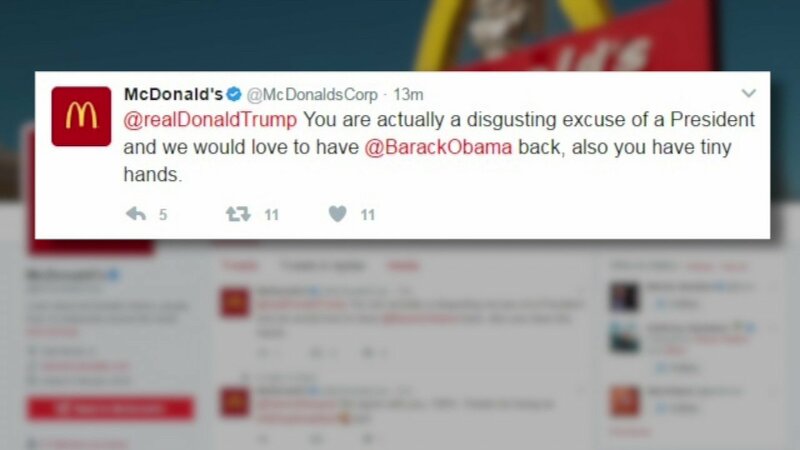 McDonald's Corporation's Twitter account insulted the president this morning. "@realdonaldtrump You are actually a disgusting excuse of a President and we would love to have @BarackObama back, also you have tiny hands." The McDonald's Corp. tweet insulting Trump was deleted about 20 minutes after it was posted. Twitters users, of course, immediately responded to what may or may not be a result of a hack. @AdamSinger So when's @McDonalds changing its corporate colour to blue? McDonald's Corp was still responding to customers on Twitter and thanking them for eating at the fast-food restaurant, even after the tweet. @EminemDisorder Best. Daughter. Ever. Keep rockin' and pop in again next time you're looking for a tasty meal! @bsoong Thanks for being an #AllDayBreakfast fan, Bernard. Care to have a McMuffin for lunch later? @DaBear67 Breakfast for dinner is the best! We love that you're lovin' it, Dean. After about an hour, the company addressed the tweet claiming their account had been compromised.